Collar X Malice is my first Otome Game that I played with lots of in-game mechanics. Compared to the usual visual novels that I played before, this game will make you really feel like a police/detective as you need to navigate a pointer to study the crime scene, shoot the enemy and more. And to tell you the truth, gaining trophies for this game is quite a pain. 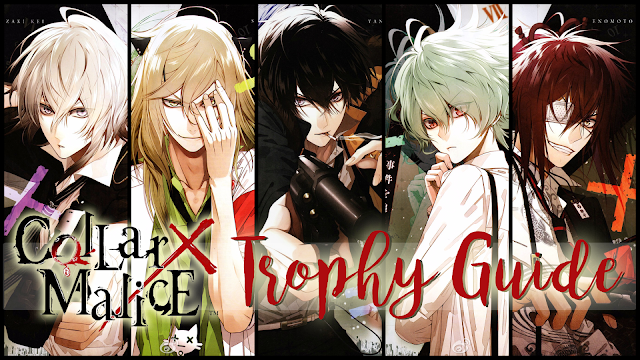 For this post, I'll be sharing the Trophy List, Trophy guide and tips on how to earn and complete the trophies. ■ There are 2 parts to gain the good ending. One is the Trust Status and the other one is Affection Status. (It was like gain their trust first before you can romance them *laughs*) There are four parts for each of them. Filling it full will lead you to good ending, which will have a corresponding trophy for each route. (check the list below for the name of good ending trophies). ■ There's a corresponding trophy for completing the Trust Status per route. (check the list below for the name of trust status trophies). ■ You'll get the [Man Behind the Collar] after typing the correct name of Zero at Yanagi's route. ■ You need to get all the bad endings of the game as well. And take note, not one - not two - but five (or more!) bad endings are there per route! The bad endings has no corresponding trophies but you need to complete it to get one important trophy. 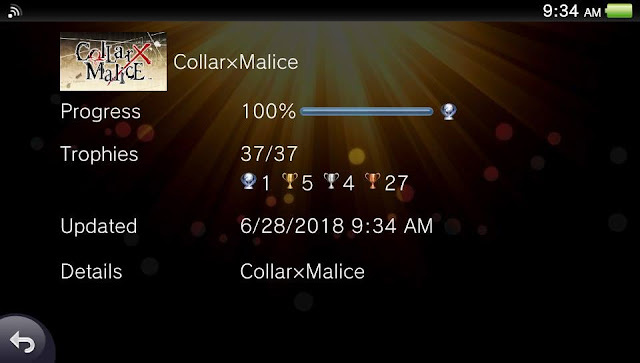 Getting a bad ending for the first time will give you [Mistakes Were Made...] trophy. ■ Each route has a Blighted Love ending, or the one I called as the 'sorrow' or 'unsatisfied ending for both heroine and the guy.' You need to get this too as each sorrow ending has corresponding CG. Completing the 5 blighted ending will earn you the [Sorrow] trophy. ■ There are question and answer part of the game, where the character/s will ask you some questions in relation to the case in focus. Getting the answer right (for the first time) will give you [Clued In] trophy; thus getting the wrong one (for the first time) will give you [Unsolved Mystery] trophy. ■ Trigger mode has corresponding trophies too. Success will give you [Shooting with Resolve] trophy; thus the Missed/Fail will give you [Wavering Spirit, Wavering Aim] trophy. ■ Once you got ALL the endings (Good+Sorrow+Bad Endings+Criminal), you will get [All Possibilities Observed] trophy. ■ CG completion is important! Once you got all CGs, you'll get a bonus one to complete the lists per route. Complete everything (each route+Criminal chapter) to get [Vivid Ideas] trophy. [The First Night] - Cleared the Prologue. [Partners] - Entered a character specific route. [Information Gathering] - Obtained information at Shinjuku police station. [On the Scene] - Explored a specific location. [Clued In] - Deduced the correct answer. [Unsolved Mystery] - Incorrectly deduced an answer. [Good Communicator] - Politely returned a message. [Mistakes Were Made...] - Reached your first bad ending. [Shooting with Resolve] - Succeed in Trigger mode. [Wavering Spirit, Wavering Aim] - Failed in Trigger mode. [Promise] - Gained Kei Okazaki's trust. [Eternity by Your Side] - Cleared Kei Okazaki's route. [Partners at Last] - Gained Mineo Enomoto's trust. [Four Leaf Clover] - Cleared Mineo Enomoto's route. [Making the Grade] - Gained Takeru Sasazuka's trust. [Happy Pet] - Cleared Takeru Sasazuka's route. [Intelligent Curiosity] - Gained Kageyuki Shiraishi's trust. [Indelible Memories] - Cleared Kageyuki Shiraishi's route. [Shackles] - Gained Aiji Yanagi's trust. [9th Executor] - Experienced Tomoki Ogata's justice. [8th Executor] - Experienced Hanako Kobayashi's crazed love. [7th Executor] - Experienced Akito Sera's guilt. [6th Executor] - Experienced Rika Sugawara's fear. [5th Executor] - Experienced Manabu Souda's solitude. [4th and 3rd Executors] - Experienced Shion and Suzune Uno's hatred. [2nd Executor] - Experienced Keisuke Sanjo's despair. [The 1st Executor] - Experienced Rei Mikuni's blind faith. [Man Behind the Collar] - Exposed the mastermind. [The View I Dreamt of] - Cleared Aiji Yanagi's route. [Sorrow] - Reached 5 tragic love endings. [Give Yourself to the Rhythm] - Listened to all the BGM tracks. [World of Continues Despair] - Cleared Saeki's route. [A Cleared Picture] - Viewed the perpetrator's pasts. [Vivid Ideas] - Unlocked everything in the gallery. [Eat Your Dessert] - Got all of the Bonus Tracks. [All Possibilities Observed] - You viewed all endings in the game, including the bad ones.